When I lived in Arizona, my tools never rusted. Arizona is hot and dry. Here in New England, rust is a significant problem. It is especially bad for people who have shops in their cellars. Cellars tend to be damper than heated rooms or garages, and dampness leads to rust. Many materials react with oxygen to form a chemical compound that is a combination of that material and oxygen. When iron combines with oxygen, it forms iron oxide, or rust. Iron oxide is a larger molecule than iron, so if iron oxidizes, it often puffs up and may even flake. This is because the rust requires more physical space than the original iron. Some things cause steel or iron to rust faster than others. Water will cause iron and steel to rust. Dissimilar metals rust faster than single metals because of electrochemical reactions, so steel rusts faster than iron, and joints between dissimilar metals rust very quickly. Salt water will cause rust faster than water because salt water is a better electrical conductor. 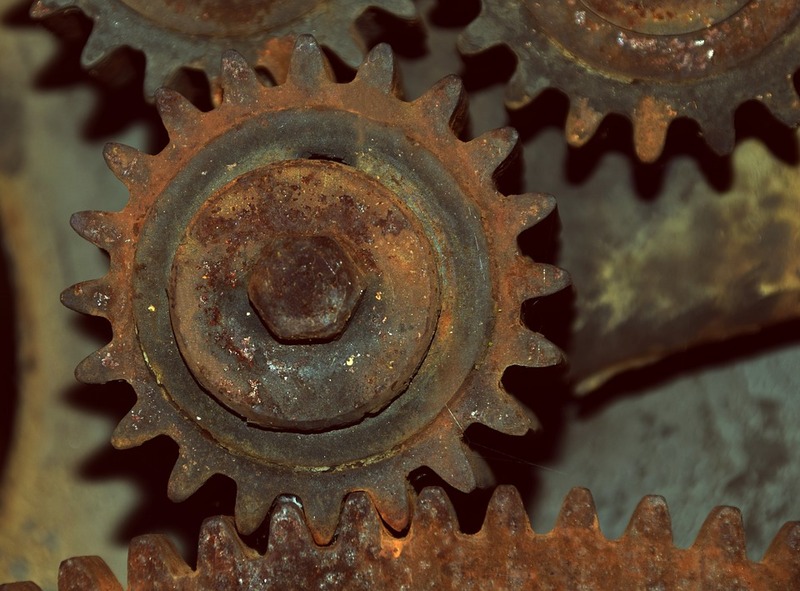 Like most chemical reactions, heat also speeds rust. If steel starts to rust, it will puff up because iron oxide is a larger molecule than iron. The puffing causes cracks and voids, which expose more bare metal to the environment. So the rusting of iron can progress and is only limited by destruction of all solid iron. Other metals oxidize, but the oxides of some other metals are no larger than the metal themselves, so they don’t puff up or flake. For example, aluminum doesn’t puff up when it oxidizes. This helps make aluminum oxide a good protective coating, rather than the start of rapid degeneration. Rust is really Fe2O3, a reddish form of iron oxide. Iron has another oxide, Fe3O4, which is sometimes called black oxide, black rust, or hammerscale. Black oxide is a good protection for steel. Like aluminum oxide, black oxide molecules are the same size as iron molecules, so black oxide does not grow or flake. Black oxide is true gun bluing and the oxide found on some drill bits. Black oxide is also seen on iron and steel that has been hot-worked. You can coat steel with black oxide by a careful regimen of rusting the right amount and boiling the rusted metal in water to convert it. This is how non-caustic gun bluing is done, and although it is tedious, it produces very attractive and durable results after several treatments. Many people say that rust lives and that you have to kill rust to stop metal from continuing to rust. The real significance is that once rust is formed, there is mobile oxygen in the metal, and the oxygen can move deeper into the metal causing further rust. Techniques to kill rust are described below. All rely on dissolving rust or converting rust into black oxide and then coating the metal with something that inhibits the formation of more rust. You can discourage rust in a number of ways. For my woodworking tools, like my table saw and jointer tops, I use Automobile Paste Wax. I put it on fairly heavily and often. It seems to work well. There are also cream waxes, but these contain some water, so I stick with paste. Another excellent product for protecting woodworking machinery is Bostik Top Cote. This is a product specifically engineered for protecting the surfaces of woodworking machinery and lubricating the working surfaces to reduce wood-to-metal friction. As this was developed for contact with wood, it has no additives which might interfere with wood finishing. For machine tools, Way Lube is the right thing. Keep unpainted parts of your lathe and mill covered with Way Lube. It’s really inexpensive, often less than $12 per gallon. For small tools, cutting bits, and stock, it is more complex. You really don’t want to dunk a center punch in Way Lube or wax it, because you don’t want it to be slippery. You also want the best possible protection up front, because it won’t be renewed. There are many commercial products that claim to displace moisture and prevent rust. Some common ones are WD-40, Starrett M1, LPS-1, and LPS-3. All come in aerosol cans, which is convenient although expensive and bad for our environment. All leave a film of light oily stuff on the metal. Other products are Sprayon Corrosion Suppressant, Rustlick 631, CRC SP-350, CRC SP-400, Boeshield T9, Birchwood Casey Sheath, and Rust-X. Some of these products are petroleum based, while others seem to be wax based. However, they all prevent rust by keeping air and water off the metal surface. Not surprisingly, each product is claimed to do everything well and to surpass every competitor. Some claim that one works better than the others, but the real differences between these products are more related to their uses. For example, some leave a heavier, tougher coating than others. Some leave an easy-to-remove coating. Some are better in the presence of salt spray. But any of them will keep rust at bay as long as the work is well coated. In general, I hear very good things from people about Boeshield T9 and I get poor feedback about WD-40. Perhaps this is because WD-40 is meant to do everything, while Boeshield T9 is specifically engineered as a treatment for long-term storage of materials. One common complaint about WD-40 is that it gums up mechanisms. You can make your own rust protection coating by mixing 1 part Anhydrous Lanolin with 5 parts Paint Thinner. Just brush it on or dip the metal in it. You can get Anhydrous Lanolin from a pharmacy by special order. Dillon Case Lube is a commercial rust protection made from Lanolin and Alcohol. Many people have reported excellent results with Lanolin and Lanolin-based rust protection products. Contrary to popular belief, Lanolin is not perfectly safe even though it is natural. Some people have allergic reactions to it. In addition, it can clog pores and cause infections. Another great technique for preventing rust is to protect the metal with a coating of zinc. This coating process is often called galvanizing. (Named after Luigi Galvani. Luigi Galvani is best known for experiments making dead frog muscles contract with electrical impulses.) Zinc is more electrochemically reactive than iron. Zinc prevents rust by oxidizing itself instead of iron. Many of today’s cars are made with galvanized steel panels. These panels won’t rust until after the paint is damaged and the zinc corrodes through to the underlying steel. You can buy Crown 7007 Cold Galvanizing Spray and other zinc-based primers in aerosol cans. Still another technique for preventing rust is to surround the metal with fumes from a material that discourages rust, such as Camphor (C10H16O) or Moth Balls. Some Moth Balls are naphthalene (C10H8) while others are paradichlorobenzene. Gun suppliers sell protective wrapping material and blocks which prevent rust by a similar technique. For example, Brownell’s sells VPI Paper and Rust Blocks Vapor Tabs. Another good product is Permatex In-Charge Corrosion Inhibitor, a moisture absorber which also releases rust-protecting vapor. Just storing your tools in a tight wooden box will discourage rust. Wood acts as a fairly good barrier to humidity and absorbs what remains. One person stored tools in side-by-side tool cases, one a Gerstner Wooden Case, the other a Kennedy Metal Case. After years of storage, the tools in the metal case showed surface rust while the tools in the wooden case were clean. Dust can be a good magnet for moisture, so if you can keep dust off of your tools, you will discourage rust. A breathable canvas tarpaulin or fitted tool cover is effective. However, avoid a cover that goes all of the way to the floor. This will trap moisture and encourage condensation on your tool. Instead, just cover the tool down to the bench or chip pan. Another great way to prevent rust is to put a dehumidifier in your shop. If your shop is a closed room or cellar, then a dehumidifier will be very effective. A dehumidifier will not be helpful in a drafty garage, but a garage may not be as humid as a cellar, either. When iron or steel starts to rust, it will puff up and expose clean metal to the open air, allowing rust to continue to the depths of the metal. If your favorite possession is already rusting and you want to clean it or at least stop the rusting, you have a few alternatives. There are a few products on the market which fall into the category of organic rust converters. These products contain acid to convert rust to black oxide and polymers which bond to rust. Instructions say to remove all loose rust, paint on the product, and let it dry. I’ve used one of these products and it did work. However, the resulting surface is black and rough. Also, the converted rust is not durable, so this may not be the right treatment for tools or stock. Some trade names for these products are: POR-15, Glean Tech Rust Killer, and RustX. Another rust treatment is to remove loose rust and coat the metal with a product like WD-40. This fills pores and rust with a noncorrosive substance and prevents additional rusting. Often, this is sufficient to slow the progress of rust and leave the tool protected for future storage. per and steel wool will also remove rust, but they don’t get into tiny crevices. Rubber abrasive sanding blocks like those made by Cratex are good at removing a thin coat of rust and can also remove rust from minute pores in the metal. Another technique for removing rust is etching with Phosphoric Acid. Phosphoric Acid has a unique property of dissolving iron oxide quickly while etching iron very slowly. This means that you can leave metal in Phosphoric Acid for much longer than necessary with very little damage. The acid will attack bare metal slowly and will start the process of hydrogen embrittlement, so use the minimum etch time that removes all rust. Another unique advantage of Phosphoric Acid is that it leaves a fine coating of iron phosphate behind. Iron phosphate prevents rust. However, the iron phosphate coating is not very thick and not durable. Some additional protection is still required. Phosphoric Acid etch will leave a hard, bright metal finish. This is because it will etch the surface slightly, exposing new, bare metal. Often this is desirable. It leaves an attractive surface and a surface ready to paint. A common product which contains Phosphoric Acid is Naval Jelly. The soft drink Coca-Cola contains Phosphoric Acid, so Coke will etch rust. But Coke also contains carbonic acid and other nasty things. You’re going to drink that stuff? Auto body shops treat metal with acid metal wash, a solution of Phosphoric Acid and alcohol before painting. This removes waxes and oils, removes slight amounts of rust that form between sand blasting and painting, and leaves a thin protective coat of iron phosphate. One commercial solution for this is DuPont Quick-Prep. Sherwin Williams has a similar product called Metal Prep. Other acids will etch rust, but not as selectively. Hydrochloric acid can etch rust very quickly. Oxalic acid has also been used. However, if you leave metal in these acids a bit too long, you will lose a significant amount of metal. Also, neither acid leaves a protective film behind. Oxalic acid opeartes to remove rust by forming a water-solable complex ion (called a chelate) around each iron ion. So do cyanide compounds. Both react likewise with the iron in your blood, meaning the oxalates are just as poisonous as the cyanides. I read of using a solution of 1 part black molasses and 9 parts water to remove rust. Perhaps this works because the molasses is slightly acidic. The procedure is very slow. After treatment, metal starts rusting quickly, so this is probably not a phosphoric acid treatment. All acids contribute some hydrogen to the metal structure. This weakens steel by a process called hydrogen embrittlement. If the metal is a cutting tool or gun barrel, for example, this weakening can be dangerous. One person claimed that if you bake the metal at 400F for an hour after acid cleaning, then you can drive out the hydrogen and prevent this embrittlement. With all acids, use rubber gloves and splash goggles, no matter how weak the solution. When thinning acid, add acid to water. Never add water to acid. One more technique for removing rust is Electrolytic Rust Removal. Rust can be electrically etched off of iron or steel in a bath of mild alkali, such as Sodium Carbonate. Connect the rusty part to the negative terminal of a 12V battery or battery charger and a scrap piece of steel or iron to the positive terminal. Use one tablespoon of Sodium Carbonate per gallon of water. This technique has many advantages. First, the alkaline solution is much safer than some of the acids mentioned earlier. It is still a chemical, so rubber gloves and splash goggles are recommended. Another advantage of electrolytic rust removal is that it will have no effect on good metal, so you can leave the work in the bath for a long time and not damage the metal. There is no risk of hydrogen embrittlement nor of etching unrusted metal. Electrolytic rust removal will leave a black oxide surface, which is the result of a process that doesn’t remove any good metal at all. The only thing removed is loose rust and embedded oxygen. If your goal is to keep as much of the original metal behind, this is the best technique. However, be prepared to immediately follow this technique with one of the rust prevention procedures, such as using Boeshield T9 or VPI Paper wrap. Guy Lautard mentioned Knorrostol in one of his popular bedside readers. He recommended it for precision tools. This is a mildly abrasive rust removing polish that can remove light surface rust on smooth metal surfaces quickly. It comes as a paste in a tube. There’s another rust removal technique used for restoring chrome on old cars and motorcycles. Rub the area vigorously with the end of an aluminum bar. This will scrape the iron oxide off and at the same time the aluminum dust formed will penetrate and react with the rust to form aluminum oxide and iron. I haven’t tried this myself. Some people have a reputation for rusting everything that they hold. These people have unique body oil. I don’t know if it contains metal salts, high moisture content, or low pH. If you have guests in your shop, be careful about letting them handle good steel or tools. You might be the first to discover that Uncle Bert is one of those guys with a corrosive touch. If you have this unique body oil, consider wearing cotton gloves oiled with something like Breakfree CLP to keep your body oils off of tools. Breakfree CLP is a multipurpose teflon oil designed to clean, lubricate, and protect metal. Another approach is to wash your hands and give them a light rub with mineral oil before handling metal. Camphor – Many large drug stores. Available as blocks and as Oil of Camphor. Dillon Case Lube – Many gun stores. For a local dealer call Dillon Precision at 800-762-3845. Knorrostol – Many tool dealers (Hammar Industrial, Kennametal, MSC). For a local dealer, call SPI at 888-774-8200. Moth Balls – Many hardware and drug stores. Naval Jelly – Most hardware stores. Permatex In-Charge Corrosion Inhibitor – Travers Tool or other Permatex distributors. Sherwin Williams Metal Prep – Auto paint supply stores which sell Sherwin Williams paint. Sodium Carbonate – Swimming pool supply stores. Ask for product to raise water pH. Does super glue work on metal? Thank you for teaching me. Forgive me if I omitted someone. I tried to check information and test many of the above techniques and materials. However, I have not tried every technique or product listed here. Some may be better than others. I am not affiliated with any company represented here. Please use proper safety precautions when dealing with all chemicals, machines, and other dangerous procedures.